By the way, I don't think too many of my regular readers have any clue about Chakras and Crystal Healing etc. But Human Chakras is a topic that I'm really passionate about. 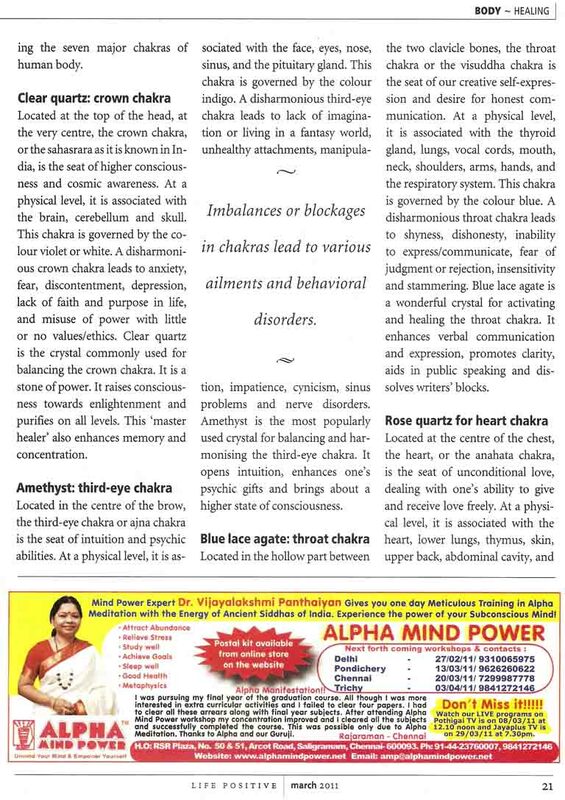 Imbalances in Chakras are the root cause of all our sufferings - mental, physical, emotional and even material (as in financial prosperity etc.)! 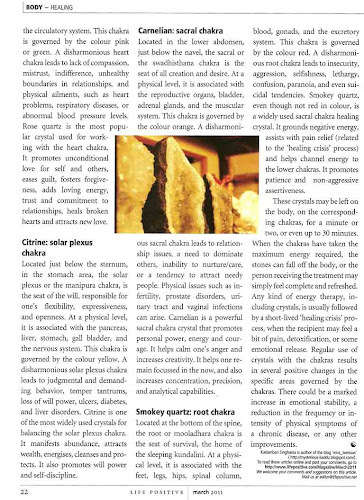 In this article, I have not only written about the common crystals used for each of the main seven Chakras in our body, but I've also given a brief synopsis of those Chakras -- their location, their primary function, the physical organs and systems they govern, and the effects of any imbalances in any of them. I've tried to write this article as simply as I could, keeping in mind a complete layman with no prior knowledge of any of these things. So hopefully, it should make sense to all of you. Please DO give your feedback on the article. If you can get a printed copy of the magazine, it would be superb. Otherwise, here are the scanned copies of the 3 pages of my article. You can click on the images to view them in large (readable) size. For further reading on Chakras, you can check out one of my old posts - "The Chakra System and Energy Healing". This is my sixth post for NaBloPoMo March 2011. Congratulations.. The post was indeed good. I knew the fact that you could have written it in more detail but from a layman's perspective it was perfect. Congratulations on getting published. 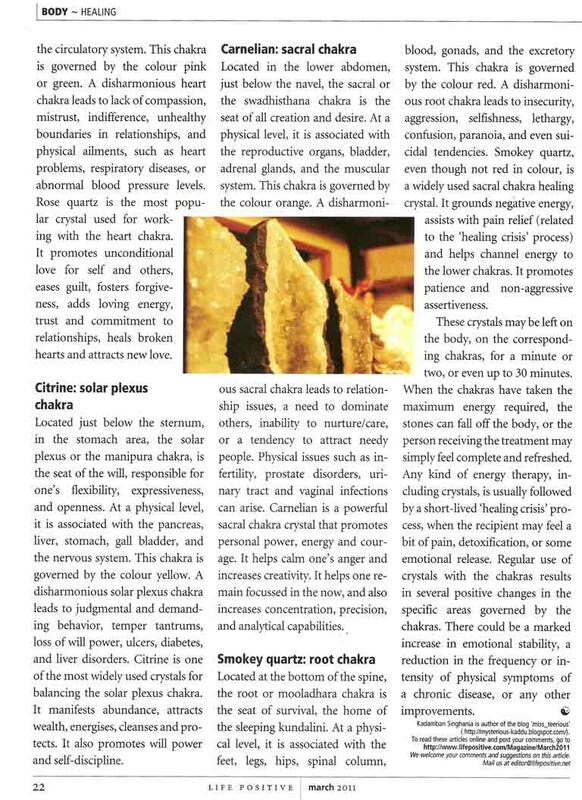 I agree that many people do not know of the power of crystal healing. Quartz crystals are an excellent way to take healing upon oneself. 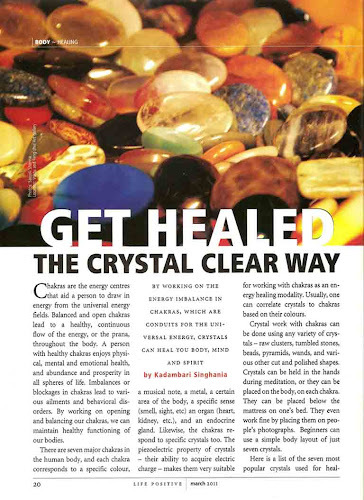 Crystal healing uses specific crystals to bring about healing and positive changes in the mind and body. The idea behind crystal healing is that gemstones carry vibrational rates, which can change a the vibrational rates of a person's aura and can affect their physical body in positive ways. Do you have a print copy? 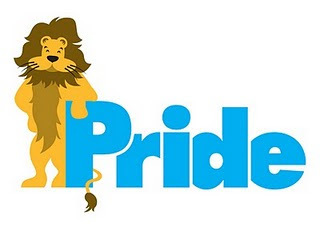 This is nice re.